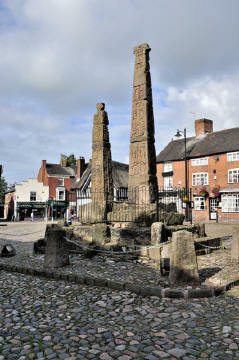 These are two Saxon crosses, sandstone obelisks, elaborately carved with animals and Biblical scenes including the Nativity of Christ and the Crucifixion, and they dominate the cobbled market square of Sandbach. 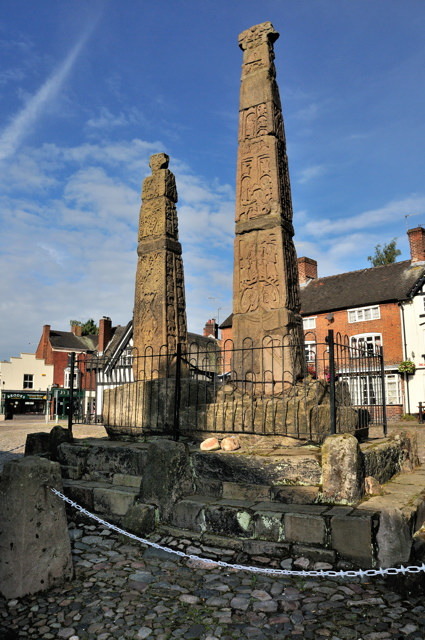 They are thought to date from the 8th or 9th century, and originally painted as well as carved, they are among the finest surviving examples of Anglo-Saxon high crosses. Some say as a monument to the introduction of Christianity into the area - but nobody really knows why they were created or even erected here. They are heavily carved and show religious scenes, doll-like heads and beasts in panels, together with vine-scrolls, interlaced patterns and some dragons. During the 7th Century Sandbach is believed to have been the pagan kingdom of Mercia. Legends suggest that King Penda of Mercia arranged the marriage of his son Paeda to Princess Alchfleda (daughter of Oswy the King of Northumbria). Puritan Iconoclasts broke up the crosses in the 17th century and the stones were scattered over a large area. They were eventually recovered and re-erected on their original site in 1816 and the square where they sit was also cobbled at this time. The crosses are two upright columns set in sockets on a base of three stepped stones. The northern cross is the taller and has a mutilated head. It has carvings of scenes from the Bible showing John the Baptist, the Birth of Jesus, his trial and crucifixion, the Ascension, the ascent of the Holy Spirit on the Apostles. The southern cross is truncated and has a mutilated head from a different cross, and shows scenes of events leading up and including Paeda's conversion and eventual marriage to Alchfleda. They have always been a pair and were carved by the same hand. It is a little confusing when you arrive at Sandbach as these crosses are in the Market Square of the town and from most of roads going through the town they are not visible, however when you approach the town from the M6 J17 following the signs into town centre (Congleton Road) two crosses appear in front of you inside a fenced garden area. 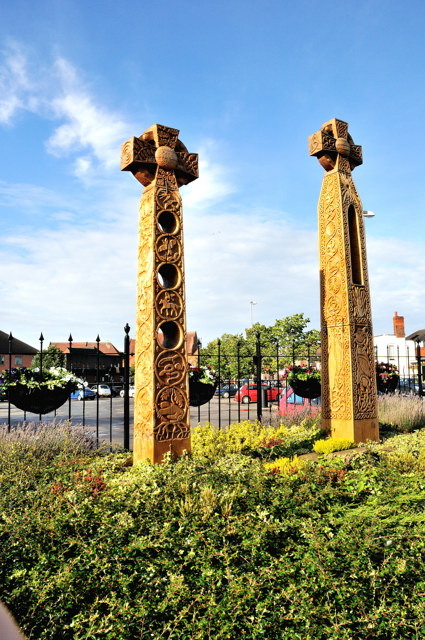 These two crosses are in fact a modern sculpture based on the originals that were created October 2006 and are carved in old English Oak using the ancient crosses as a theme. Behind them is a free car park and if you park in here you can then walk through a pedestrian area to Market Square and see the original Saxon ones. Well worth a stop off on a longer journey. From M6 J71 take the A534 towards Crewe take the first right, Congleton Road which is signposted to town centre. Follow this round until you see the replica town crosses in front of you. Park in the car park behind. 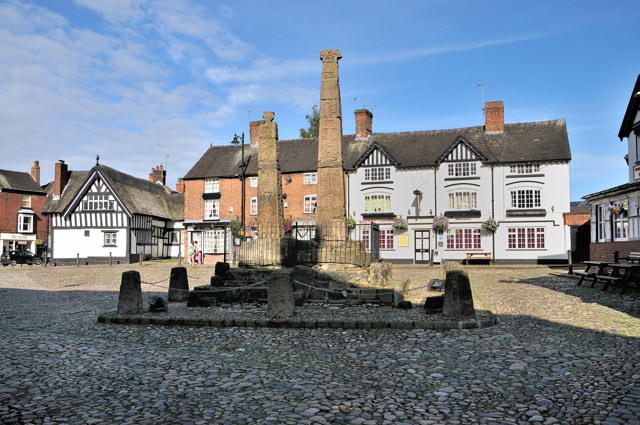 Market Square - a preserved cobbled area in the centre of town off High Street. 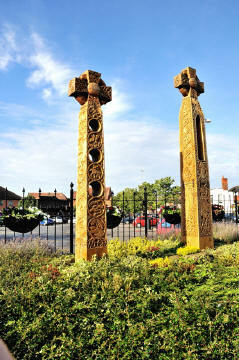 Car Park in The Commons (triangle) then walk through the pedestrian shopping area opposite and the Saxon crosses are in front of you. Crosses, a number of interesting buildings, the church which has an unusual outside walk through bell tower, is difficult to photograph as it is surrounded by trees from all sides. No restrictions, however watch for the position of the sun as at some times of the day they will be in heavy shadow. Special Needs Access: Wheelchair use over the cobbles would be difficult, but you can get a view from the roadside path.